A well established medical equipment supplier with stock exceeding 16,000 products, from the leading medical product manufacturers in the UK. Customers purchase products over the phone using our comprehensive product catalogue, or online on our 24/7 e-commerce store. Over 12,000 GP surgeries, NHS staff and other healthcare providers rely on us to supply their medical equipment, pharmaceuticals and consumables. HCE has rapidly increased its turnover with international projects and now exports to over 50 Countries. HCE is a selected distributor for leading medical brands, due to its outstanding reliability and customer service. We deliver on a next day service in the UK and have a great service reputation, which has ensured we continue to be a market leader for many years. 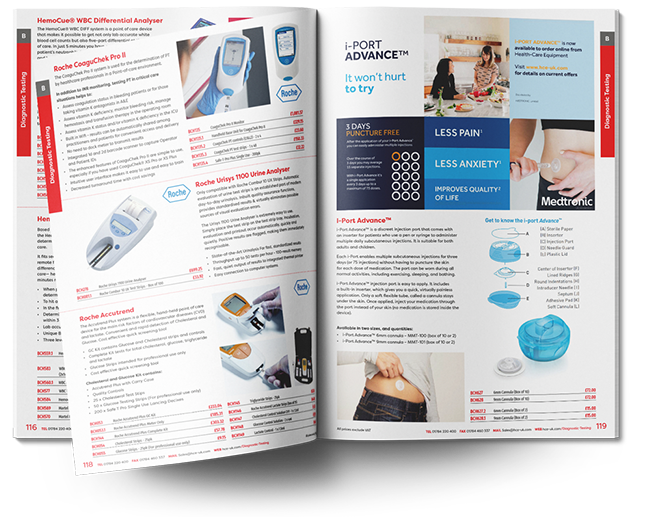 Healthcare-Equipment & Supplies Co. ltd.
We provide both digital and printed versions of our own product catalogue annually. These detail a large number of our most popular medical products, listed across 500 pages and segregated in to over 35 categories. Each year our catalogue is updated to include the latest product developments and highly requested services. These catalogues are delivered to healthcare providers across the United Kingdom. You can request your own printed copy, delivered directly to your door or alternatively download a high quality pdf from our website. A discreet injection port, with an inserter for patients who use a pen or syringe to administer multiple daily subcutaneous injections. It is suitable for both adults and children. Each i-Port enables multiple subcutaneous injections for three days (or 75 injections) without having to puncture the skin for each dose of medication. Each device has a built-in inserter, for quick, painless application. A soft flexible tube stays under the skin. Once applied, simply inject your medication through the port instead of your skin. HCE-UK are honoured to have been granted exclusive distribution rights to this innovative product for sales within the UK. Our fully-trained and knowledgeable staff are available to help with your every need. Our team are focused on building customer relationships and providing a good service as opposed to being solely product driven. Our staff are able to provide product support & spare parts, book a service or training demonstration for your new products. If there is something you need help with or if you would like to request a quote, we are always available.